This site is about the metal clay classes I teach at various locations in the Los Angeles area. Metal clay, also called Precious Metal Clay (PMC) or Art Clay, makes metal working so easy that in a few hours you can create one or more fine silver jewelry pieces. 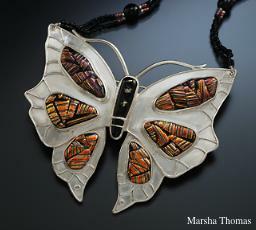 I love making one-of-a-kind jewelry pieces with metal clay, but teaching is what I enjoy most. You can see examples of my work in the Metal Clay gallery and my work in traditional metalsmithing in the Traditional gallery. Experience the joy of making wearable art using metal clay by taking a class to learn how to best use this revolutionary material. The classes I offer range from beginning to advanced. Silver is ideal for enhancing beads, glass, ceramics or polymer clay that you may already be working with. My goal as an instructor is to help you discover your creativity and successfully make what you like.